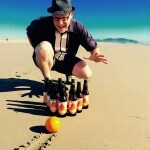 In 2011, Tacoma musician and homebrewer turned professional brewer Matt Coughlin and four friends pointed their compass toward the Olympic National Park. They made their way through rugged terrain, past thick rainforest and across melting snow along the Bailey Range Traverse. Trekking between Mt. Ferry and Pulitzer Peak the hikers came across the most enchanting spot to pitch a tent. They called it “Cool Camp.” Coughlin recounted his magical backpacking adventure as he and his fellow Double Mountain Brewery brewers guided Peaks and Pints through the brewing process of our new house IPA. As he recounted glorious mountain peaks and green valleys while we stirred hops inside the Hood River brewery we knew our IPA had a name: Cool Camp IPA. Peaks and Pints celebrates its two-year anniversary today, with the release of Cool Camp IPA tonight. In celebration of our anniversary and new house IPA, we present an all-day flight of Double Mountain beer that we call Craft Beer Crosscut 11.1.18: A Flight For Second Anniversary. 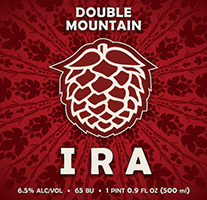 St. Patrick’s Day 2007, Matt Swihart and Charlie Devereaux opened Double Mountain Brewery & Taproom, named after the orchard they owned, Double Mountain Orchards — where one can look in one direction and see Mt. Adams and then look in the other direction and see Mt. Hood. Double Mountain sits in downtown Hood River, which Sunset Magazine named “Best Adventure Town” in its 2015 Travel Awards. “The scenic setting, in the shadow of snow-capped Mt. Hood and the meeting of the Columbia and Hood Rivers, resonated with our judges, as did the startling breadth of experiences possible in this Oregon town — hiking, biking, fishing, rafting, skiing, paddle-boarding, and the West’s best windsurfing. The apres-adventure crafter beers had fans, too,” states the article. This Dublin-style stout is a quintessential Double Mountain interpretation of a classic style. It’s rich, creamy, roasty and beautifully bitter that pours with a thick head, courtesy of nitrogen. The nose is roasted malt and some dark chocolate. Flavor is similar — rich roasted unsweetened dark chocolate. Except a semi-dry finish as you cheers you day’s adventure. This India Red Ale pours a deep red-brown with a frothy white head. With a more-balanced hop profile than most IPAs, it’s a best seller at the Hood River brewery. The hybrid has the hoppiness of a Northwest IPA and the earthy maltiness of a red ale. Dip the nose in for initial sweet, bready malt followed by light citrus and piney hops. On the tongue, expect orange and grapefruit hops balanced by earthy malt, honey and light herbal spiciness. “Tropic resin, tangerine / Petrichor and evergreen / Fill your chalice, fill it wide / Then pass it upon the left hand side” — so states Double Mountain Hop Lion hype. Hmmm … Matt Swihart is a music freak, Hop Lion’s bottle sports Jamaican colors and “left hand side” … could it be a nod to British Jamaican reggae band Musical Youth? Whatever. This IPA is delicious with bitter, citrus peel like aroma and gritty, malty, earthy and tangerine flavors, mon. 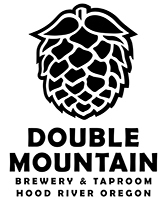 Double Mountain celebrated its 11th anniversary this past March. To mark the occasion it released a special barrel aged beer, Eleven, a bourbon barrel aged barleywine. “This is a beer to thank everyone for eleven wonderful and flavorful years,” stated brewmaster/owner Matt Swihart in pre-release hype. “Cheers to all our beer fans everywhere. Let’s keep it rolling.” The 13.2 percent ABV barleywine has been aged in Heaven Hills bourbon barrels for the better part of a year. Rich caramel, date, and vanilla give way to a mouth full of ripe fruit, molasses and treacle. “And I heard a voice in the midst of the four beasts, and I looked to behold a Pale horse, and the name that set on him was Death, and Hell followed him” — Revelations, Ch. 6. Giddy-up! This Belgian imperial IPA smells like ripe kiwi, mango and pineapple consort with the coriander and orange peel of the Ardennes yeast. It kicks with noticeable bitterness that hangs in balance with a hint of malt sweetness hiding in the vast, pale orange foundation. And yet, it finishes dry for a beer of this formidable stature.